Joette LeBlanc and her granddaughter, Amelia at the Pointe Coupée museum, Louisiana, USA. Artists From Baton Rouge. 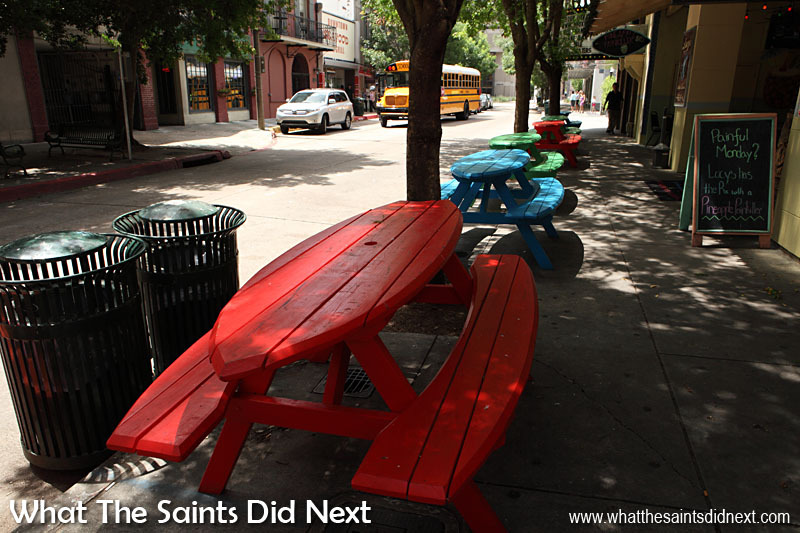 The day we met artists from Baton Rouge. We love meeting and talking to people on our travels. They give first-hand insight into their part of the world and culture stamping authenticity to the places in a way the travel brochures can never do. So, we were delighted when Joette LeBlanc politely introduced herself having overhead our conversation at the Pointe Coupée museum. She was fascinated that people travelling from a tiny Atlantic island were there in the middle of Louisiana, USA! Within hours of her returning home, she was a follower of our blog. 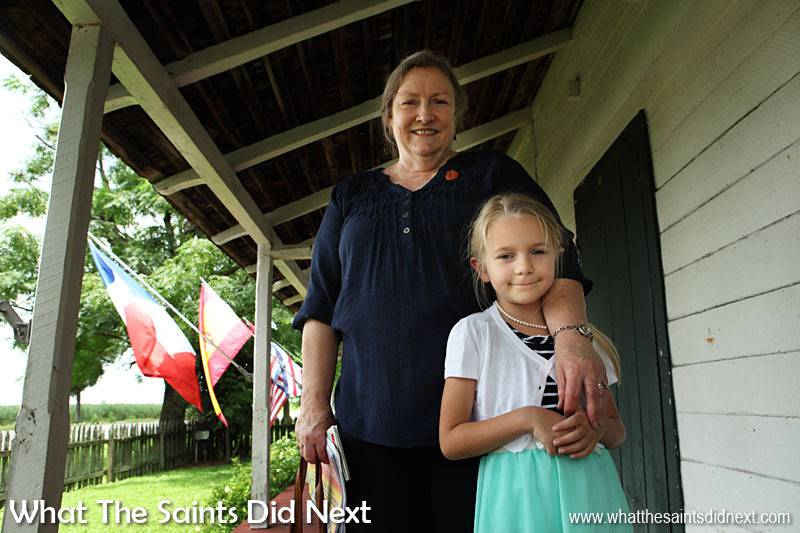 Joette was there with her lovely granddaughter, Amelia (6), both from Baton Rouge, Louisiana. Amelia was visiting to collect her second place prize in an art contest; a ribbon and package of art supplies. It was the first time she’d entered a competition. “It was in the Petite Gallery and it was a picture of a vase of flowers,” Amelia proudly told us. “Two different kinds of lilies. 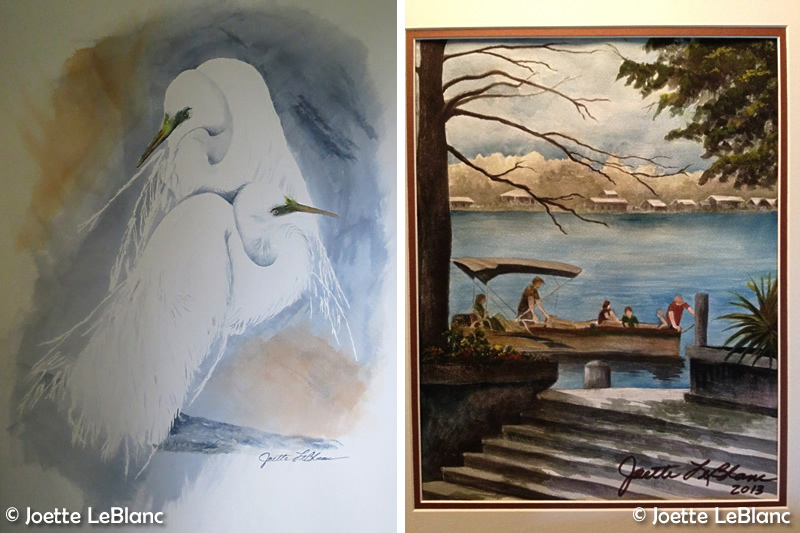 One of them was yellow and the other was red.” Her grandmother fetched the painting from the car for us to see. 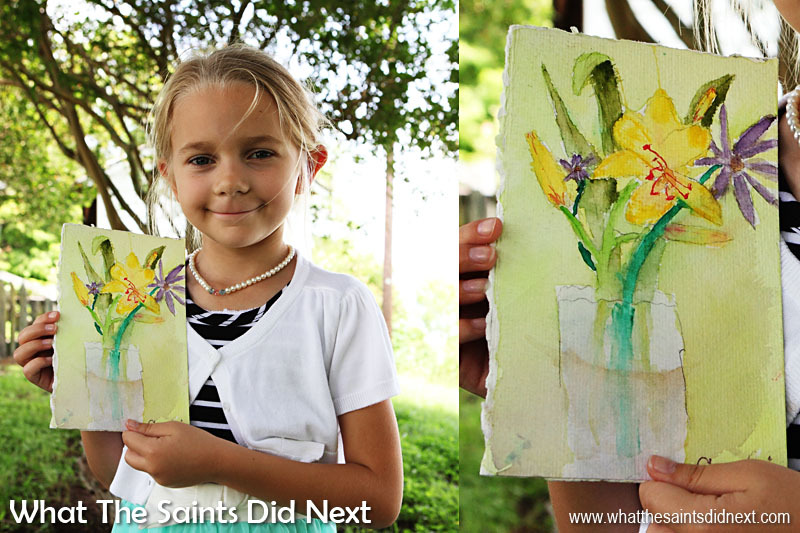 Baton Rouge artist, Amelia at the Pointe Coupée museum, Louisiana, with her prize winning painting. Artists From Baton Rouge. It was a watercolour and even to our untrained eyes we recognised detail and skill beyond her six years. At the moment Amelia doesn’t have a favourite subject with art, she’s open to everything. “My mummy inspires me,” she told us. 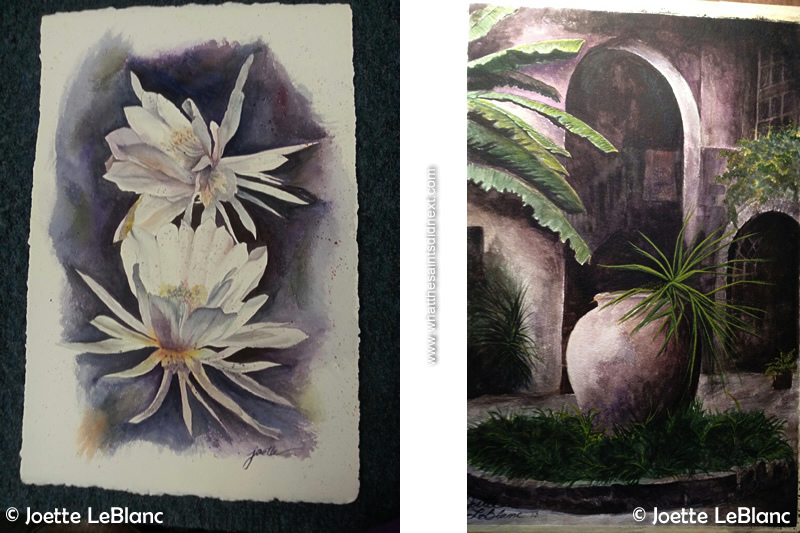 Paintings by Joette. Left, ‘Love Mates’ and right, ‘Family Ties.’ – Baton Rouge is the furthest inland port on the Mississippi River that can accommodate ocean-going tankers and cargo carriers. Artists From Baton Rouge. We asked Joette what’s the best thing about Baton Rouge? “Well it’s home to me, I was raised there, my family and my husband’s family are there and most of our kids are there. We have one son who just got married in New Orleans, who was working in Galveston, his wife just graduated from medical school. We saw them briefly for the wedding and then they took off for Birmingham. 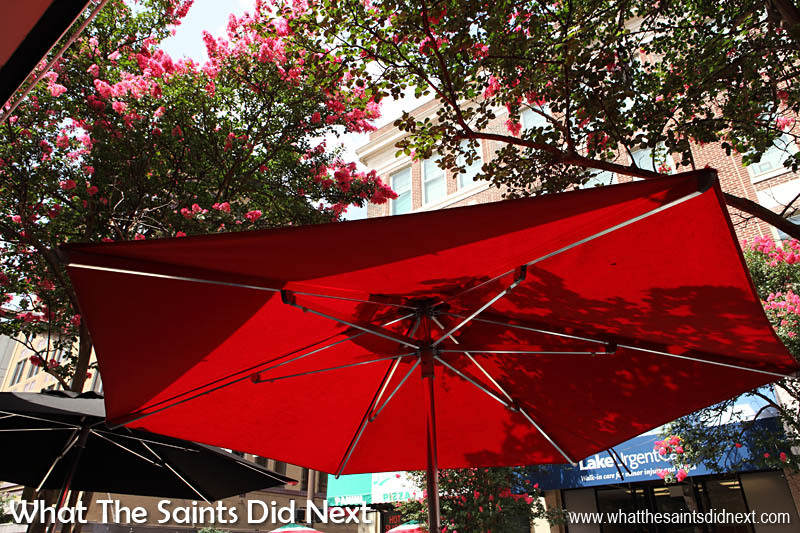 Taking shade along the sunny streets of Baton Rouge, Louisiana. Being from St Helena, one of the most remote islands in the world (for now), we are always interested in other people’s travel experiences. “I’ve been to China and Aruba,” Joette told us. “My experience with Aruba was really nice, my husband was working there and he got to bring all our family down. So we just fitted in with the locals for about three months. Old State Capital building of Louisiana in Baton Rouge, now Museum of Political History. 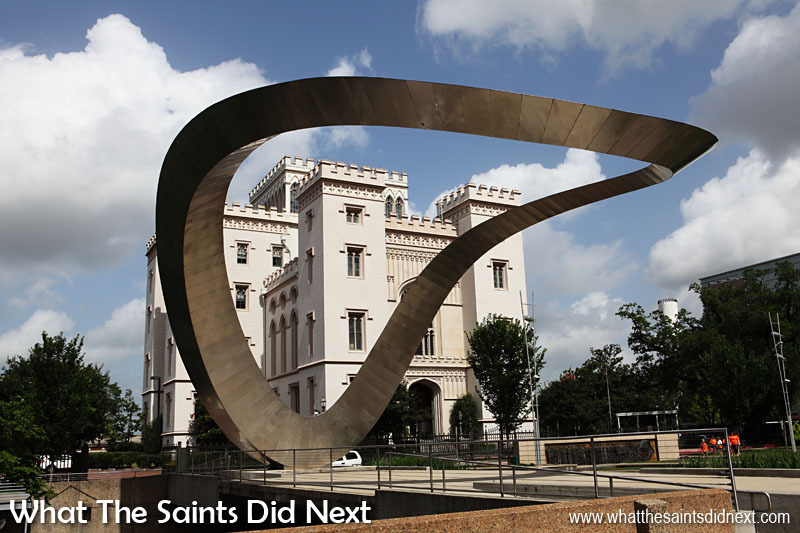 Sculpture at the Old State Capital building in Baton Rouge. “China was a different story. My church sent some people there to carry bibles, and we stayed about a week. I found it fascinating, real good people; they accepted us. Perhaps the best part of talking and connecting with people around the world is realising we pretty much all want the same things. Whether we’re from Cambodia, St Helena or USA; love, home, family and friends. The Horace Wilkinson Bridge carrying Interstate 10 over the Mississippi into Baton Rouge, Louisiana. 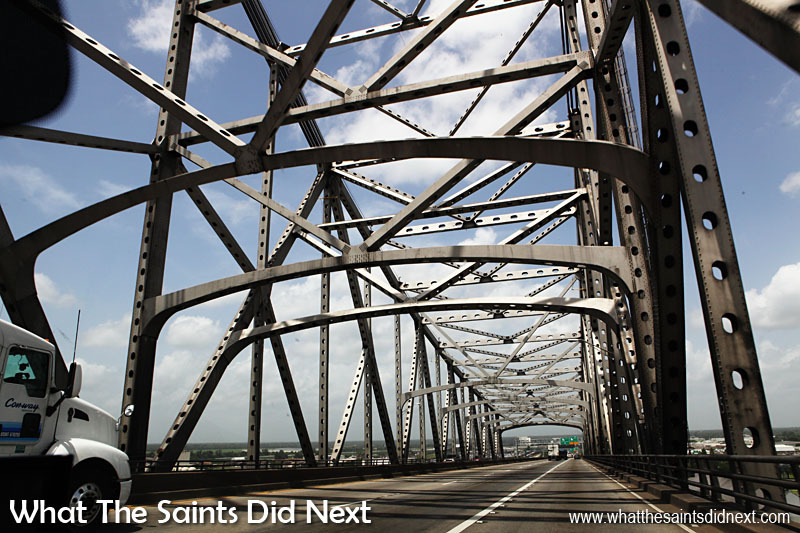 This cantilever bridge is more commonly known as the ‘New Bridge’ as it’s the newer of the two Baton Rouge bridges.